The odds above are those offered by British bookmaker William Hill on 26 May, a few days before the start of the World Cup. Note that William Hill cruelly rated New Zealand twice as unlikely to lift the trophy as North Korea (at 2000/1 compared with 1000/1). This despite the All Whites’ FIFA ranking being 26 places higher than Kim Jong-Il’s hermits (78th to their 104th). How very ironic, then, that our so-called easy-beats should end up as the unbeatables — indeed the only 2010 finalists to remain undefeated in World Cup Finals since 1982. But even New Zealand’s surprise showing must take second place to the stellar achievements of Paul the Psychic Octopus. In picking Germany to beat Uruguay for third, and Spain to beat Holland in this morning’s final, the oracle mollusc finished the tournament with a perfect 8 correct picks out of 8. William Hill could do worse than offer him a job. … who remain unbeaten at the World Cup. I’d love Holland to win the trophy, after watching those brilliant Dutch teams of the 70s dip out to hosts West Germany and Argentina. Before the tournament I picked Brazil (the only country to win the World Cup on a foreign continent, which they’ve done twice), then Germany. But I picked the Germans for their mental toughness. Not their flair. But what flair they now have — similar, ironically, to Cruyff’s Dutchmen of ’74. This is a very special German team — the only team since Pele’s Brazil in 1970 to score four goals three times in the one World Cup. So my head says that unless they implode like the Hungarians of 1954, Germany will beat both Spain and Holland. Of course, a Dutch patriot could make a similar argument for the Oranje. They’ve now gone 26 matches unbeaten, with 14 straight wins in this World Cup if you include qualifying. But then Ferenc Puskas’s Hungarians had gone 31 games without tasting defeat. They’d thrashed West Germany in the first round, reigning runners-up Brazil in the quarters, and reigning champs Uruguay in the semis. I guess, as any Crusaders fan knows, it’s about who’s ahead at the end of the last match. If Klose can avoid getting red carded against Spain, I still think it’ll be those fearless young Germans. A bizarre bit of statistical flotsam flitted into my mind about 4am yesterday as the German football maestros were giving the Argentinian handball player Diego Primadona his karmic comeuppance. It’s so unreal it could be straight out of Ripley’s Believe It or Not. If world number one Spain or three-time winners Germany win the 2010 FIFA World Cup, only one team will finish the tournament unbeaten. And that team will not be Spain, and it will not be Germany. Nor will the unbeaten team be five-time champions Brazil or four-time champions Italy, who lost to Holland and Slovakia respectively. It will not be two-time champions Argentina, or their Falklands foes and Wembley one-hit wonders England, both of whom were blitzkrieged by Germany. It will not be 1998 winners and reigning runners-up France, who qualfied by dubious means, were smashed by two Mexican waves, then surrendered, squabbling, to South Africa. It will not be former World Cup placegetters Portugal (edged by Spain), Chile (outplayed by both Spain and Brazil), South Korea (beaten by Argentina and Uruguay) or the USA (yes, they were 3rd in 1930 — beaten this time in extra time by Ghana). It will not be the back end of the Czechoslovak pantomime horse, since the Slovaks were beaten by fellow former double bridesmaids Holland. It will not be two-time placegetter Yugoslavia’s latter-day sliver, Slovenia (ousted by England), or its rump Serbia, who went to all the bother of upending Germany, only to succumb to unglamorous Ghana and Australia. Same story with former hosts Switzerland, who gored the Spanish toreadors, but were burned by the not-so-hot Chile and could only draw with the humble Hondurans. It will not be those Hondurans, who went down to Chile and Spain, or Spain’s latest Latin victim, Paraguay. Or two-time hosts Mexico, who fell to that neighbouring pair of one-time hosts and two-time winners, Uruguay and Argentina. It will not be former European champion Denmark or Greece, each of whom was karate-chopped by an Asian former host (Denmark by Japan, Greece by South Korea), with the Greeks being lassoed by the Argentinian gauchos for good measure. Ghana (cruelly denied by those greedy Uruguayans on penalties after squandering a spot-kick winner at the death). It most certainly will not be the outrageously misnamed Democratic People’s Republic of (North) Korea, who were monstered by Portugal 7-0, clobbered by Cote d’Ivoire 3-1, yet, oddly, barely shaded by Brazil (2-1). Spain and Germany are playing in the semis. That means one of them will end up with two losses. The other will line up in the final against either Holland or Uruguay — both currently unbeaten. So the championship decider will be between a team that’s lost once, and a team that’s yet to lose. At worst, we’ll have to share the unbeaten mantle with one other team. But on present form, it look like we won’t have to share. The youthful German juggernaut should steamroll the Spanish the same way they crushed their Argentinian cousins. The Dutch should have too much flair and/or discipline for Uruguay. And Germany should be able to outpace their old enemy in a rerun of the epic 1974 final. If that happens, I repeat… the only team to leave South Africa without a loss to its name will be… ours. And that’s not all. Oh no. Having earlier beaten Serbia 1-0, then seen Serbia beat Germany 1-0, and Germany beat everyone else that matters (including Australia 4-0, Argentina 4-0 and England 4-1), we’ll be able to brag with only slightly twisted logic that we’re the Giant-Killer Killers of World Football. Not a bad outcome from our only actual recent win! In honour of this remarkable achievement, I suggest this team be christened the Invincible All Whites — a cheeky play on the Invincible All Blacks of 1924. OK, so those All Blacks won 32 out of 32 and these All Whites drew 3 out of 3. Who’s counting? This is the world game. Roll on Brazil 2014 and the first All Whites’ victory. In honour of possibly the stupidest tax in New Zealand history, which comes into effect today. If you like it, pass it on. 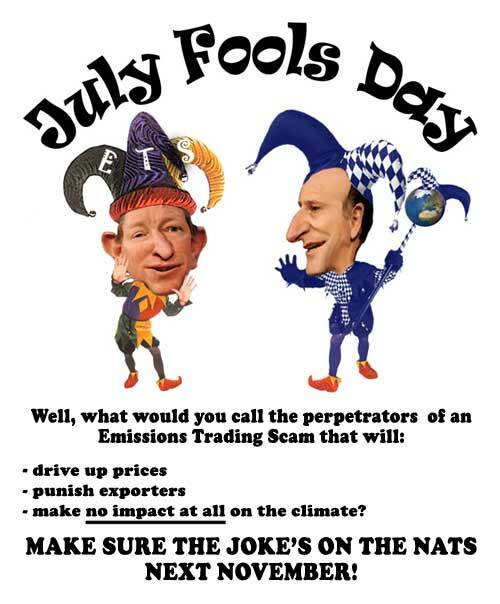 The more the public can be encouraged to link their price rises with John Key’s and Nick Smith’s totally pointless ETS, the sooner the Nats will be encouraged to scrap it.